Who doesn’t have a favorite soup? A soup that takes you back to a special place or time. A soup that makes you think about that particular person that prepares it especially for you. Or a soup that makes you feel well and even happy! This soup takes me back to my childhood when coming back from school my mom was waiting for us with a” Sopa de Fideo”. I know, it is some of the most humble dishes of our everyday Mexican cuisine but it is one that will show up in so many homes across the country. Like the “Chicken Noodle Soup” in America. 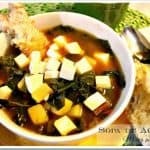 I haven’t cooked this soup for a long time until I saw my friend Nora posting it on her blog. I even made it twice in a week! Just using the veggies I had on hand like carrots, zucchini, chayote, spinach, or whatever is deep down in your refrigerator’s vegetables drawer. 2. Add 1 tablespoon of the oil in your soup pot over medium heat. 3. Add the Vermicelli and lightly stir fry it. This will take a couple of minutes. Remove and place in a separate plate. 4. Add the other tablespoon of oil to the pot and add the carrots. Cook for about 2-3 minutes. Add potatoes, onion, chayote, and zucchini. Cook and stir for about 5 minutes. While the vegetables are cooking place the tomato and the garlic cloves in the blender with the cup of water and blend until smooth. 5. Add the tomato-garlic mixture to the pot and stir. Lower heat and simmer for 5 minutes. 6. Add the Vermicelli and simmer for 3 more minutes. Vermicelli cooks very fast. 7. Stir in the chicken, the chicken borth, and simmer until the Vermicelli is tender. Season with salt and pepper. 8. Serve in bowls and garnish with chopped cilantro an a squeeze of lemon juice if desired. Mexican Vermicelli Soup with Chicken and Vegetables | It is some of the most humble dishes of our everyday Mexican cuisine but it is one that will show up in so many homes across the country. Like the “Chicken Noodle Soup” in America. Prepare all your ingredients dicing the vegetables. Add 1 tablespoon of the oil in your soup pot at medium heat. Add the Vermicelli and lightly stir fry it. This will take a couple of minutes. Remove and place in a separate plate. Add the other tablespoon of oil to the pot and add the carrots. Cook for about 2-3 minutes. Add potatoes, onion, chayote and zucchini. Cook and stir for about 5 minutes. While the vegetables are cooking place the tomato and the garlic cloves in the blender with the cup of water and blend until smooth. Add the tomato-garlic mixture to the pot and stir. Lower heat and simmer for 5 minutes. Add the Vermicelli and simmer for 3 more minutes. Vermicelli cooks very fast. Stir in the chicken, the chicken broth, and simmer until the Vermicelli is tender. Season with salt and pepper. Serve in bowls and garnish with chopped cilantro an a squeeze of lemon juice if desire. And now, tell me: What is your favorite soup? It is a great main dish as well. It just need some warm tortillas, roll them up and dip them in the broth. I also fry the vermicelli first. What a great soup, I love how versatile this is, and how healthy. Thanks for sharing this with Sunday Night Soup Night, look forward to seeing you again soon! Thanks a lot for the Tweet. I'm making this recipe today! We had the Napales with Charizo last night for the second time.It has become a favorite of my husband who is from Veracruz, MX. Last night I served it with warm flour tortillas, a side of white rice, and avocado. It was a big hit, the second time around as well as the first! !I like mine with a dollop pf sour cream. Yesterday, I also boiled up 5 chicken thighs(added salt, onion,garlic to pot) to make something today with them. But I wasn't sure what I was going to make.I was going to make Chicken Tinga, but decided to make your Fido soup instead.I've made Fido soup before, my husband and I like it, I haven't made it in a while. I am a big fan of chayotes and have never used them in my Fido soup. I HAVE used them in beef soup and stew. Today,I'm following your recipe! I've also 'pined' it on Pinterest! It's cooking now..smells so delicious, can't wait to try it!! I've made Fido Soup before but never Mely's, I'm sure it will become another of Mely's favorites around here! And thank you for your kind comments, it is good to know this recipe is working for the many readers that stop by this blog. Your comments also helps readers to decide on trying a recipe. Please follow us in facebook where I post pictures of my cooking during the week. PS. My mom is from Veracruz too. Ran across your blog and I found it very impressive , especially this Sopa de fideos, I do a very close recipe, as a Illinois raised Mexican, we had this often I did a version and submitted it to a cookbook and got big favorable responses , my great aunt from Corpus Christy Texas was a big inspiration in my life. I am a chef been one for 42 years did my study in Long Beach California, you have a great list of recipes. Chili Colorado is my favorite. Thank you! Ernesto for taking the time to write about your cooking experience. I must have a great repertory of recipes yourself. I will have to post that recipe pretty soon. Happy cooking! Gracias por la receta tratare de hacerla en cuanto pueda y mi sopa favorita es clam chowder. Love!! How would I incorporate this into a pot of boiling chicken legs? Would I fry the fideos before adding into the pot, and add the tomato sauce in the pot as well? How do you recommend I do this? Thank you in advance? You can skip the frying part, but I highly recommend it since it also adds flavor and the fideos won’t stick together this way. And yes, add the tomato sauce to the pot. Hi! You have chicken stock in the ingredients list, but it is not in the instructions. When/how do I add the chicken stock? Hello Martina, add in step 7, with the chicken. Enjoy!